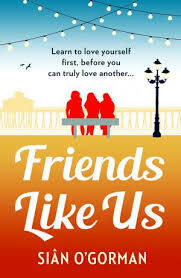 Friends Like Us is a really heart-warming book that I thoroughly enjoyed. The story centres around three main characters, Melissa, Steph, and Eilis. The three ladies used to be friends throughout their teenage years, but lost contact (as often happens when school ends). Fast-forward years later when they are reunited, and they become firm friends again. We learn that Melissa, although she is doing well with her career, has a lot of personal issues she needs to address . Steph is trying to juggle her emotional, often bitter, teenage daughter, as well as her cheating husband, all whilst trying to find the person she once used to be. And Eilis is a doctor who still grieves the loss of her mother from many years ago, as well as having relationship issues with her partner, Rob. They each need the courage to change their circumstances. But can they do it? You'll have to read and see!! The women are all strong and brave, even when they doubt themselves. The book shows us that it's never too late to chase your dreams, and find peace within yourself, even if that means things in your life need to change. It's a great message. I loved this book, and thought it was really well-written, and very engaging. I was given an ARC (advanced reading copy) through netgalley in exchange for an honest review before its release next month.